More newness! 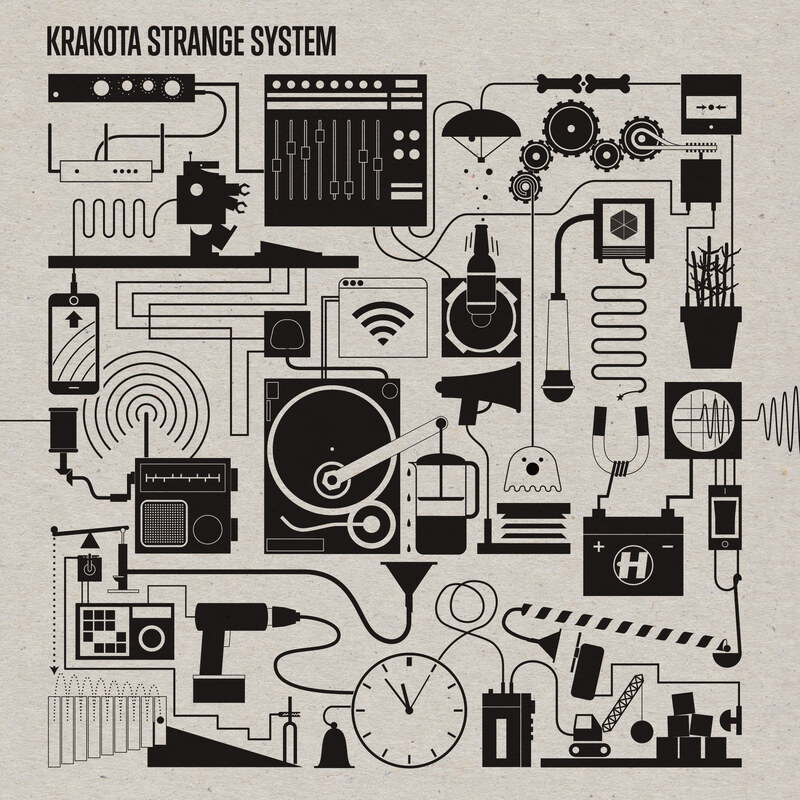 Here is the artwork I created for Krakota’s debut album. He called the album ‘Strange System’, which is totally up my alley when it comes to record titles. The title made me think of black boxes (as in science/engineering, not aerospace), which are systems that you can give input to and get output from without having any idea of what happens inside the system. I had some crazy idea to create some artwork completely obscured by a black box, but that was too, well, obscure. Everyone on the project seemed to like what I was drawing to go into the box though, so we ended up with that as the cover itself. Everything is connected in this artwork! Clearly some of the objects are straight out of the mechanical/system corners of my noggin, but a lot of it comes from Krakota – his love of vinyl, celebratory beers and coffee to fuel the writing process, audio bits and pieces, and objects taken from some of his track titles. On the cover is a xylophone (from Xylo), a ghost, some samphire, an ice machine (for Ice Hands), some bones (for Lazy Bones), and the odd elastic bands. There are more track titles in the gatefold artwork too. I kept my illustrations on this artwork as geometric as possible to make it feel very mechanical, so to contrast that and bring it back into the world of humans, we had all the artwork printed on a nice and heavy unbleached card stock. It roughs it up just the right amount and looks pretty fresh in physical too. Check the Hospital Shop if you need a copy in your life!